^ Alfonso Cuaron To Return To Harry Potter?. JewReview.net. 2006-11-18 [2006-11-18]. （原始内容存档于2007-12-14）. ^ Daly, Steve. 'Phoenix' Rising. Entertainment Weekly. 2007-04-06 [2007-04-01]. ^ Carroll, Larry. Terry Gilliam On Depp, 'Potter' And The Film He Panhandled To Promote. MTV. 2006-10-16 [2006-10-16]. ^ Smith, Sean. Now, Watch Very Carefully. Newsweek. 2007-02-17 [2007-02-11]. ^ Deathly Hallows to Be Shot Using "Loads of Hand-Held Cameras. The Leaky Cauldron.org. [2009-03-31]. ^ Newgen, Heather. Yates and Heyman on Harry Potter 6. Comingsoon.net. 2007-07-10 [2007-08-07]. 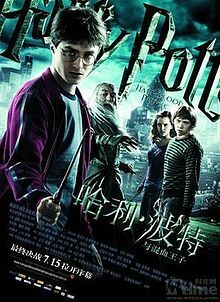 ^ "Half-Blood Prince" Filming News: Threat of Strike to Affect Harry Potter Six?. The Leaky Cauldron. 2007-09-19 [2007-09-19]. ^ No Scottish Funding Sends Film Production Overseas. This is North Scotland. 2006-09-08 [2006-09-09]. （原始内容存档于2015-03-28）. ^ Harry Potter scenes set to be shot in Ireland. The Sunday Business Post. 2007-02-25 [2007-02-25]. （原始内容存档于2007-02-27）. ^ Macleod, Murdo. Cape Wrath casts its spell on Harry Potter film-makers. The Scotsman. 2007-05-27 [2007-06-10]. ^ 11.0 11.1 Pupils board the Hogwart's Express. Lochaber News. 2007-10-13 [2007-10-12]. ^ Adams, Katie. Village set for Harry Potter Filming. Wiltshire Times. 2007-10-18 [2007-11-10]. ^ Adams, Katie. Fans gather for Harry Potter filming. Wiltshire Times. 2007-10-25 [2007-10-25]. ^ 14.0 14.1 Dan Radcliffe, Michael Gambon Film Scenes in Lacock Tonight for Half-Blood Prince. 2007-10-25 [2007-11-10]. ^ Husbands, Helen. Harry Potter film on location in Surbiton. This is Local London. 2007-11-16 [2007-10-19]. ^ Location Filming for "Half-Blood Prince" at Millennium panderbolt Bridge in London. The Leaky Cauldron. 2008-03-09 [2008-03-09]. ^ "Half-Blood Prince" Filming Updates with Emma Watson, Alan Rickman News. The Leaky Cauldron. 2007-11-28 [2008-01-27]. ^ Interviews: Depp, Burton, Carter and Rickman Slash Through Sweeney Todd!. 2007-11-26 [2008-01-27]. （原始内容存档于2008-02-09）. ^ 人人都愛哈利波特. 2009-07-19 [2009-07-24]. （原始内容存档于2009-07-25）. ^ 陳泓銘. 09台灣西片總票房 無敵《變形金剛》 續集吸5.7億稱霸. 蘋果日報. 2009-12-23. ^ 哈仔票房勁收449萬 創香港非假日開畫紀錄. 2009-07-17 [2009-08-18]. （原始内容存档于2009-07-21）. ^ 混血王子席捲全球，全球五天票房逼近四億美金. 2009-07-20 [2009-07-24]. （原始内容存档于2009-07-26）.